In August, I will be blogging here at Girls in the Garden for 8 years and I am having a giveaway a month until August. I will draw for a winner on May 10th, so entries end midnight central time on May 9th. Good luck and thanks again for all the wonderful comments on my blog. Congratulations! Eight years is a commitment. 8 years! Wow! You are amazing, and thanks for the amazing giveaways! Congratulations! What a great giveaway again. What a fabulous give away Lori. I always look forward to your blog posts and it is amazing that you have been doing them for almost 8 years. Congratulations. Love all your inspirations and ideas to improve my sewing! Thanks for your commitment to sewists everywhere. This is one of my "regular" sewing posts to go to. Congrats on being included in "Inspired to Sew" magazine. Look forward to the giveaway. Eight years of blogging is a testament to your tenacity, Lorie. Congrats on the anniversary. Yours was one of the first blogs I discovered. I have learned a lot from you. Thanks! Congrats on your blog. I found you first through podcast and been follower ever since. I enjoy your blog and this book really intrigues me. I have a new granddaughter and I am sure I will be sewing lots of knits in the future. This is a wonderful prize Lori. You are so generous. 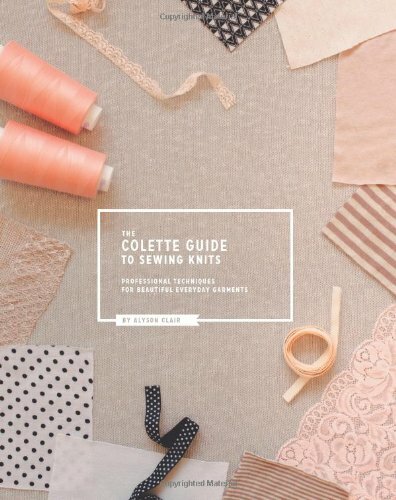 I have the Colette knits book on my wishlist! Thank you for your giveaways. I have been following you for two years. I have also listened to all of your podcasts. As a newer seamstress I found it so helpful to hear which patterns you made and the adjustments that you did. Congratulation on eight years. I am about to cut out my first knit project. The book is on my want list and would be terrific to win. 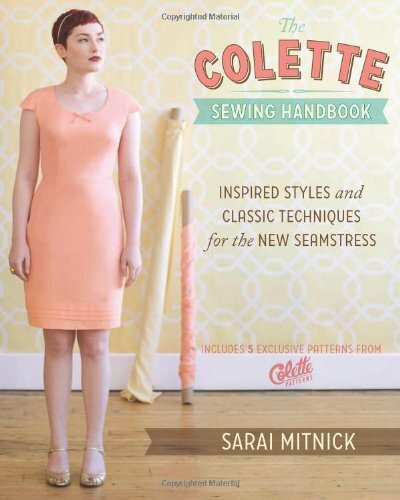 These are great books to add to anyone's sewing reference library! Thanks for sharing your sewing knowledge and projects I have certainly gained sewing inspiration from you. Lori, what a wonderful giveaway! Keep on sewing and inspiring. Lori - what a wonderful giveaway and congrats on 8 yrs of blogging. I just discovered your blog and have been reading thru your archives. I've been quilting for years and just now getting interested in making clothes so your blog has been a great inspiration and learning tool for me. Another awesome giveaway! Thanks Lori! You always inspire me to create something beautiful. Lori, thanks so much for your awesome giveaway. Keep inspiring us! Lori, thanks for your generous give-away! I love reading your blog; you're such an inspiration! What a great giveaway! I'm just learning to sew with knits. Awww congrats on eight years! I read Collettes blog and boy does she have good advice. One can never stop learning. Wow! 7 years...well, here's to 7 more! Excellent giveaway! Me please! Congratulations and thank you for sharing a bit of your life with us! Congratulations that's a long time. I would love to win this giveaway to help improve my sewing skills. Thanks for the chance. Congratulations on 8 years of blogging! I love reading your blog as we have similar tastes in clothing. Thanks for hosting this giveaway. I love reading sewing books so thanks for the chance to get this one. 8 years, wow! Thank you for the wonderful giveaway! Congrats. I really enjoy your blog. Keep up the great work and the giveaways. Sewing book are one thing my sewing room DOESN'T have, so I would be thrilled to win these. Thanks again for your wonderful blog, and all the inspiration it brings! Congratulations on 8 years blogging. That is quite a commitment! Congratulations! You have a beautiful blog and I love reading about your projects! Thank you so much for the giveaway! I've been eyeing both of these books. I so hope I win. Thank you!! Congratulations on 8 years. I found you through your podcast and didn't find the blog until the podcast ended. I still miss the podcast, but your blog is wonderful. I can't believe you get so many garments completed and so beautifully! I love your blog Lori, I enjoy your blog. Your blog is one of my favorites and I love your style. How fun to have some new sewing books for inspiration in my collection. Congrats on almost 8 years! 8 years! Whew - I'm exhausted just thinking about it. Congrats from Sydney (where we love knits). I first met you on PatternReview.com. So glad you blog beautifully & faithfully. Congrats on 8 years & may there be many more. You're an amazing blogger - thank you for continuing to inspire so many sewists with all your beautiful creations.